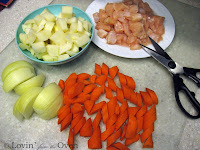 This recipe has nice chunks of carrots, potatoes and onions. It does need a touch of sweetness to balance out the heat of the curry, so add a chopped apple during the last five minutes of cooking. Or, if you prefer, drizzle a little bit of honey to taste at serving. To get that golden brown color, add just a touch of McCormicks Caramel coloring. Doesn't change the taste. Just looks better. Looks just like the picture on the box of S&B's curry. It's not often that I make something that looks just like the picture on the box! I put oil in the pan and get it hot. 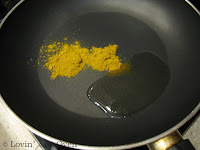 Then I add the curry powder, stirring for about 30 seconds. 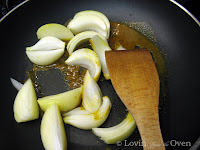 This enhances the flavor of the curry and infuses it into the oil. I get all my vegetables ready. Chop, chop, chop away! And cook it until I don't see any pink. That looks so good! Then make the chicken broth. This stuff is so much better than the cube or powder! Dump the broth in, your carrots and potatoes, and add about 2 c. more water to cover the veggies. Bring to a boil, cover, and simmer for 20 minutes. 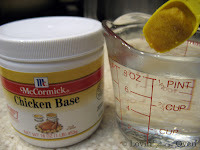 Uncover, then add your thickener: 2 T. + 1/4 c. cold water mixed together. Slowly pour over your mixture and stir until thick and bubbly. Serve over hot rice. Soooooo good! 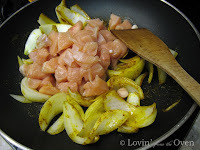 Wouldn't you know it, this is just what I have cooking right now for dinner! 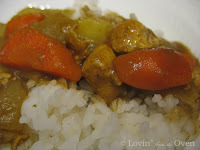 I LOVE chicken curry - have done ever since living in the Philippines. 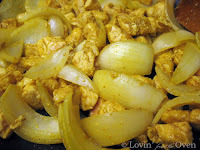 I'm glad to find your recipe without the S&W curry - I'll have to try it!